Measurements: 2.76 x 4.72 inches, or 70 x 120 mm. Back of card: Blue & white checkerboard (6 x 10) of flower motifs taken from the deck. The center four squares are taken with a larger flower, itself surrounded by four fleur de lys. Booklet included: Large for a booklet, small for a book: 2.76 x 4.73 inches, or 70 x 120 mm. 160 pages, perfect bound. This is the complete Key to the Tarot, by A.E. Waite, with a foreword by Liz Greene. Not illustrated. Publisher: Rider Books, part of Random House, UK. Distributed in the US by US Games. Printed in Belguim. 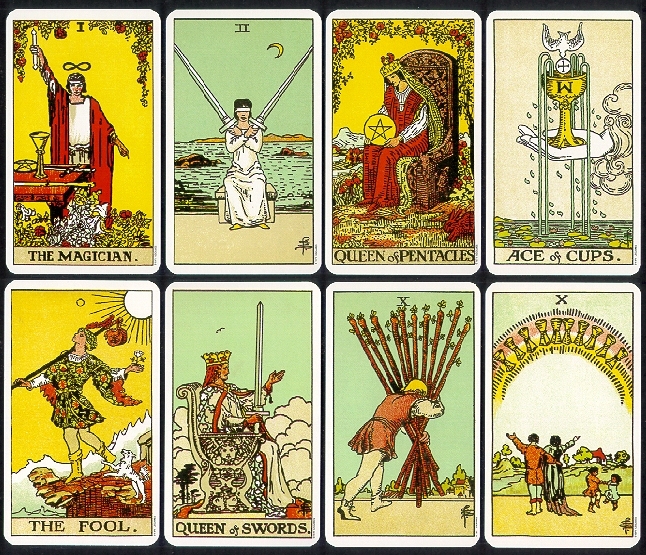 Comments: This is said to be the cards with the colors as Rider originally printed them, back in 1910. Contrast to the current edition here. However, they are not the original size, as you may see by the measurements above. No English printer of the day would have trimmed to exact metric measure. The enclosed book by Waite is said to be "revised", but no editor is named & it lacks the illustrations of the later editions. I would presume it to be an early revision by Waite himself. Though you may think Waite would write the definitive book on his own deck, he deliberately did not. Like many occultists, he gives only hints. I must concur. Although it's not exactly common, I myself have seen people blindly walk off the edge of cliffs, found them lying on the ground, dead from ten swords, and dangling serenely by one leg. But seriously. The Rider-Waite deck, the foundation of all modern decks, was, in fact, the production of two famous members of The Order of the Golden Dawn, which was, in fact, a secret esoteric order. They were not the only members of that Order to create a deck, nor was that Order the only order to have created its own, unique tarot deck. For her part, Liz Greene was exposed to Theosophical teachers during the time she studied with the late Isabelle Hickey, in the late 1960's - early 1970's. Greene didn't care for it, which is her right. She happily studied psychology instead, which eventually came to include the work of C.G. Jung, archetypes & more. It is amusing to see her throw stones at Waite - and the (unnamed) Coleman-Smith. Nicely boxed, wish more deck & book sets were.